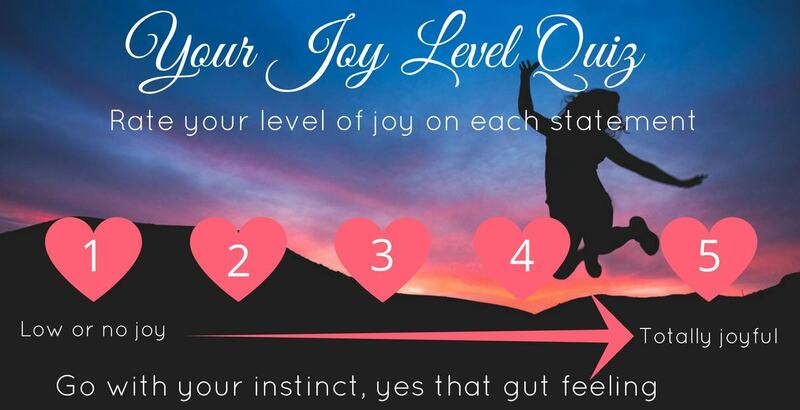 Take this Quiz to find out where your joy level needs some attention. You will get your results immediately when you finish the quiz and they will be emailed to you as well with a daily exercise to monitor your daily joy level. So make sure to put in your name and email below. 1. Health: "Our health is our wealth" How joyful are you about your health? 2. Relationships. Rate your overall joy level for your primary relationships - family and close friends. 3. Business/Career. What's your regular level of joy you feel daily about your business or career? If you don't have a business or career use your daily life as the area for joy. 4. Finances: how joyful are you when you consider your current and prospective financial situation? 5. Spiritual/Inner life: What joy do you have about your "higher self" - think peace of mind, clear sense of purpose and worth...? 6. Self Love: What level of joy do you have in terms of loving yourself, as evidenced for example in giving priority to you first, to your health, your needs? 7. Vision: What level of joy do you experience when you consider your vision for your future? Does your picture bring you joy? 8. Energy: How joyful are you about your regular energy levels? Do you wake up highly energised and maintain that throughout out the day? 9. Loving Your Body: How do you score for joy about your body (as it is)? 10. Contribution: What joy score do you give yourself for your contribution, to the community, to others?